Two weeks ago, I redesigned the first floor of a reader's "new" 1873 vacation home that she planned to gut and renovate completely. This week I'll continue with planning for the second floor of what I feel is a fascinating and challenging project. I have found throughout my experience in home design that providing storage space and adequate bathroom facilities are crucial in designing vacation homes. People would rather sacrifice the overall size of the bedrooms in order to achieve these conveniences. The interior dimensions of the space measure 21 feet 3 inches by 27 feet, which is not very large. 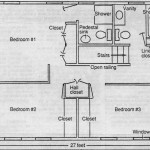 Three bedrooms will be needed in order to sleep six people, as requested in the reader's letter. There is a half-bath on the first floor for convenience, but if at all. Possibly there should be two full baths upstairs to accommodate frequent showering and bathing. Plenty of closet space will also be needed for storage, a commodity often lacking in an older home. As you approach the top of the stairs from the first floor, I would put a window in the wall straight ahead to flood the upper hall and stairs with light. On the right of the stairwell, I would use an open railing, rather than a solid wall to visually make the hall appear more spacious. Immediately to the left, at the top of the stairs, I would install the main bathroom, which would serve two bedrooms and also be convenient to the first floor. Place the tub-shower in the outside corner with a small closet to the right for linens. On the left wall, between the tub and the vanity, I would install a window that would be directly above the window in the laundry room below. It would be wise to keep all the plumbing on the inside walls, as shown, to prevent freezing. As you turn to the right at the top of the stairs and walk down the hall, I placed two bedrooms across the front of the house. Again, the windows are directly above those below for symmetry. There is a large closet in each room with a hall closet abutting them. These roomsÂ areÂ rather small,Â Â butÂ couldÂ easily wall to the right as you enter, with the door to the master bath to its left. I put a 3-foot shower stall in the bathroom, opposite the door, with a window on the wall between the two. Next to the shower, I put the toilet, aligned with the one in the main bathroom to somewhat simplify the plumbing. On the adjacent inside wall, I placed a small pedestal sink that conserves space but is still very functional. 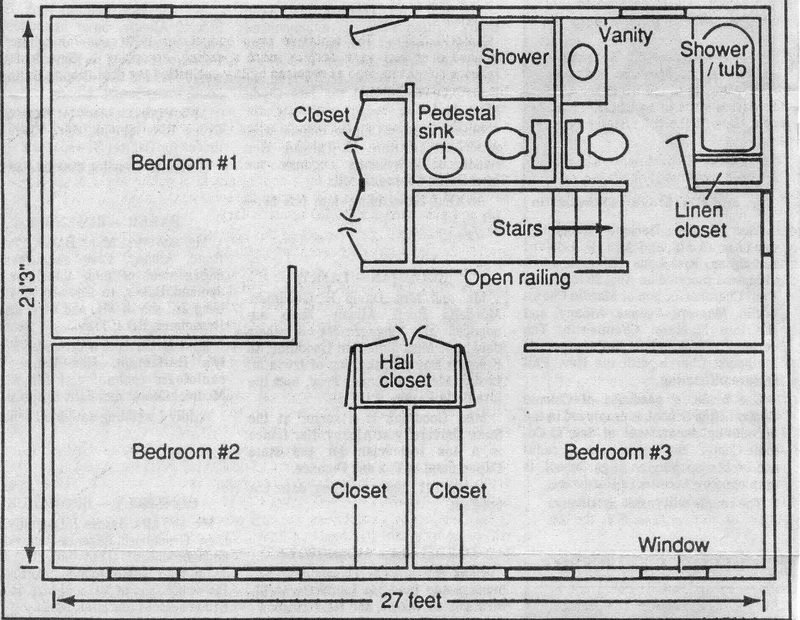 This layout accommodates six for sleeping, has the two full baths upstairs and has lots of closets for storage. The spaces certainly are not huge, but should serve the reader's needs and won't feel uncomfortably small. Considering the given square footage, I think it works very well.